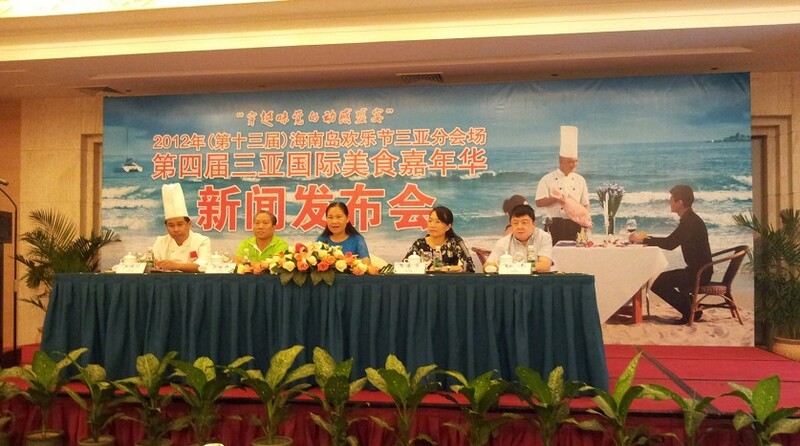 The press conference on 4th Sanya Int’l Food Festival was held at Resort Intime Sanya Wednesday. As a supporting event of the 13th Hainan Joy Carnival, the 4th Sanya International Food Festival 2012 is scheduled to be held from December 25th to January 1st, 2013, according to a press conference held at Resort Intime Sanya Wednesday. The festival will cover six major events combining art, culture, tourism and cuisine. The opening ceremony will be held at 17:00 at Dadonghai Square, with a special activity named ‘A Thousand People Drink Coconut Juice’. There will be a trade fair of delicious snacks at the square during the event. At the carnival the International Food Week, which is jointly organized by high-end hotel brands in Dadonghai, Sanya Bay, Yalong Bay and Haitang Bay, will display various kinds of food and snacks from Italy, Russia, Thailand, France, Germany and Portugal, to give residents and tourists a chance to try these delicacies. In addition to this, in order to promote the cuisine culture of Sanya, a cooking contest will be held for the first time, to represent Sanya’s classic top ten dishes and select the most promising cooking stars.